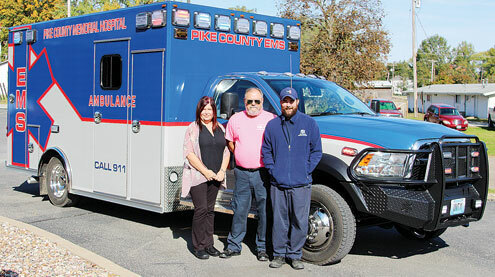 It has taken a little over a year of research and work, but all three ambulances in the fleet for Pike County Memorial Hospital (PCMH) are now identical in equipment and features that best address the needs of the area and safety for patients who will be transported and the crews staffing the rigs. Emergency Room/Emergency Medical Services Director Reesa Vanhooser said the project got underway more than a year ago. She explained there was input from EMS and other staff to determine the type of equipment that was needed and the types of rigs themselves. “It’s more unique to the needs of our county and our staff,” she explained. All of the rigs are four-wheel drive to handle the terrain the ambulances often must travel. All of them feature new electric stretchers that have hydraulic lift/lower mechanisms. EMT Gary Moore noted that all of the ambulances have lock-down monitors along with other equipment that can now be locked into place and not become a projectile while in transport. All three have blanket warming devices. He added that all of them have been set up so they are easy to clean and get back into service following a call. Moore further pointed out there are dual large-capacity oxygen tanks so patients can be transported farther before that becomes an issue. The newest rig features an upgraded heavy-duty front bumper, since deer are an ongoing hazard in Pike County. “We wanted them all to be uniform so that staff can move from one to the next and everything is the same and not different from one to another,” Vanhooser pointed out. All of the rigs also feature digital-locking on drugs, particularly narcotics. Vanhooser noted the hospital is constantly looking at ways to ensure the best treatment and safety for patients and this was a major achievement. PCMH Ambulances service approximately 3,200 calls per year. PCMH is very grateful for the support from the community that allows the hospital to continue to purchase high-quality equipment.